All the bells and whistles of the Free version, but no advertisements! Reminiscent of the old claw game at the arcade, but so much better! Grab stuffies to score. 5 different types of stuffies to collect, and 5 different colors of each. 5 more stuffies are unlockable through achievements! 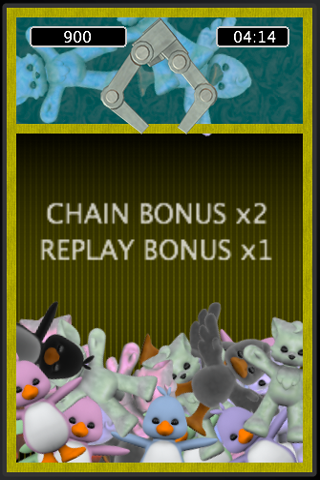 Chain similar colors or types for bonuses, or get the same color and type for an added replay bonus. Play in a classic arcade mode with multiple rounds that build on each other, or practice in single rounds of 15 and 30 seconds each. Local high scores help you track your progress, and online OpenFeint leaderboards give you bragging rights to trash-talk your friends (Android or iOS). Available in a free (ad-supported) version, as well as a 99 cent (ad-free) version. Same leaderboards. Same trash-talking. Same fun. If you release a stuffy before the crane has returned to the top, there's a slight chance he'll be stuck in limbo and the score won't count. Viewing OpenFeint Leaderboards on older devices can sometimes cause the application to crash. High scores should still be updated, but you may only be able to view leaderboards from the main menu. Rewrote stuffy spawn algorithm so that appear in a way that's more challenging. Changed scoring and timer for Play/Challenge mode so that it's more challenging. Added new stuffies and hidden stuffies. Added local and OpenFeint achievements that unlock hidden stuffies. Added a “Stuffy Info” page so you can view stuffies collected. 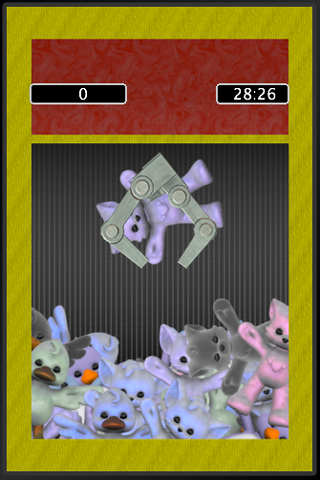 Chains of stuffies now increase the speed of the crane. Mute button and Quit button added during gameplay. Unfortunately, due to the massive rework in scoring and achievements, old scores for Play/Challenge mode will be reset (but honestly, it wasn't very challenging to begin with). Also, a new OpenFeint leaderboard will be stood up for the new Play/Challenge mode, although the old leaderboard will be kept up for some time. Apologies for this, but this should ensure a level playing field for all newcomers.